Visitors to Disney World’s new Pandora-World of Avatar land are in for a cinematic experience! LAKE BUENA VISTA, FLORIDA, May 9, 3017: It’s not a movie set, but visitors to Disney World’s new Pandora-World of Avatar land are in for a cinematic experience. The 12-acre land, inspired by the “Avatar” movie, opens in Florida in late May at Walt Disney World’s Animal Kingdom. It cost a half-billion dollars to build. The marquee attraction is Flight of Passage, where a 3-D simulator plunges riders into a cinematic world. You feel like you’re riding on the back of a banshee, a bluish, gigantic, winged predator that resembles something out of the Jurassic era. Wearing 3-D glasses and straddling what resembles a stationary motorcycle, you’re strapped in, then the lights go out, a screen in front lights up and you’re swooped into a world of blue, gigantic aliens called Na’vi, with moon-filled skies, plunging waterfalls, jumping marine animals and towering ocean waves. Disney designers are quick to say the new land is the star of the action, not the backdrop. “The character is being portrayed and played by the place itself and that’s different than a set,” said Joe Rohde, the design and production leader of Pandora — World of Avatar. Other aspects of Pandora can’t quite compete with the excitement and immersion of Flight of Passage. Much of Pandora, at least during the daytime, is hard to distinguish from the rest of Animal Kingdom, Disney’s almost 20-year-old zoological-themed park with lush landscaping, an emphasis on conservation and a Noah’s ark range of animals. The enormous blue Na’vi aliens from the “Avatar” movie appear sparingly, really just on Flight of Passage and a second attraction called Na’vi River Journey. 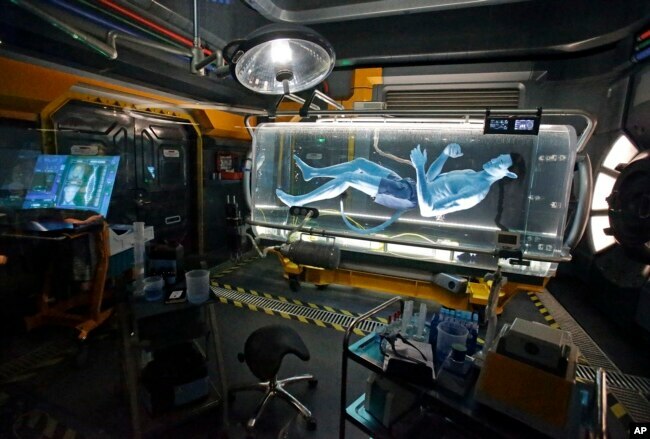 Before going on Flight of Passage, visitors walk through a tunnel in a faux mountain until they stumble upon a laboratory that includes a Na’vi floating in a tank. The other main attraction, Na’vi River Journey, is an indoor river ride in the dark, lit up by glowing creatures and plants. The ride culminates with a Na’vi animatronic woman beating on drums as a chorus of voices reaches a crescendo. Images of the Na’vi riding horse-like creatures appear behind lush foliage, glimpsed in the distance from the river. Disney has been building attractions themed on movies since Disneyland opened in 1955 with rides inspired by Snow White, Peter Pan and Alice in Wonderland. Often, as with Pandora, the attractions open years after the movies debut. “Avatar” came out in 2009. Director James Cameron’s sequel isn’t due out until 2020. Lands based on “Star Wars” are scheduled to open in Disney parks in California and Florida in 2019. Pandora-World of Avatar isn’t tied to a narrative from the film but rather tells a story set in the future, after humans degraded the jungle through industrial folly and a resurgence of nature overtakes the human-built environment. That theme is a recurring architectural motif, for example with a beverage stand and cantina made to look like they were built for industry by humans but then overrun by plant life. 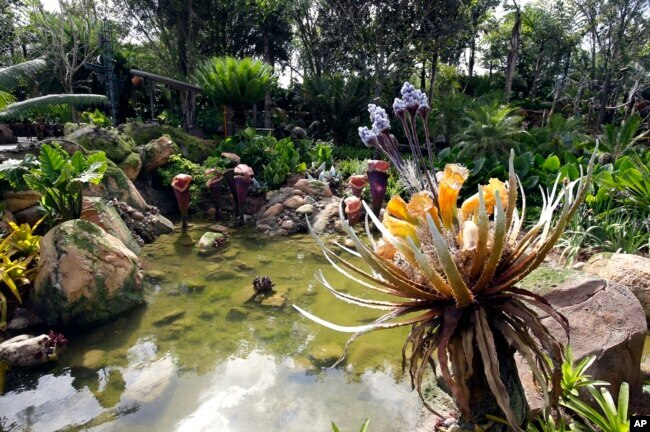 Throughout Pandora, real plants intermingle with artificial plants that resemble alien pods or Dale Chihuly glass sculptures. It’s difficult to distinguish what is real. “We were trying to get as close as possible to fool the eye,” said Zsolt Hormay, a Disney creative executive. The focal points are a 135-foot (41-meter) mountaintop where Flight of Passage is located as well as “floating mountains” that appear to be suspended in air but are actually made of concrete. Engineers use tricks to make the park appear bigger than it is. The artificial foliage gets smaller as it goes higher on the mountain to give it the illusion of distance. 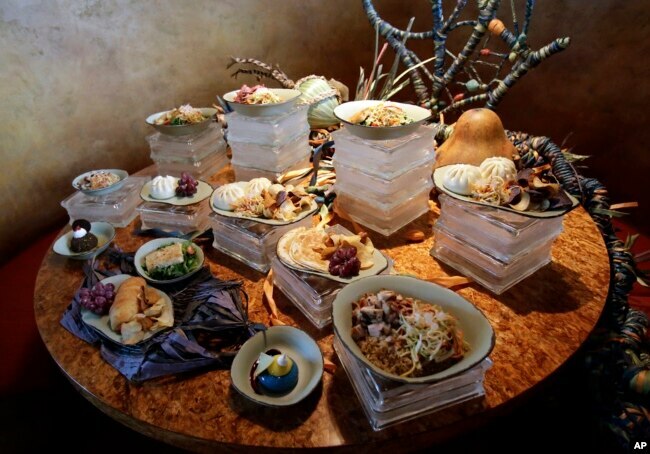 Disney also is testing out a new way to order food at Pandora. Before going to the park, visitors can pull up a menu on the My Disney Experience mobile app, order lunch and go about visiting the park. When it’s time to eat hours later, they can go to the canteen, tap on an app a button that notifies the cooks they are present. Several minutes later their food will be ready in a special line. “I hope when people come to Pandora and their eyes will be open and they will look at the world a little differently when they go back across the bridge,” Landau said.